—Diane Lutz, pastor of adult ministries, First Baptist Church, Riverside, California. “A fresh look at the Beatitudes that provokes us to reevaluate our intimate relationship with God, drawing the reader closer to the Lord.” —Brenda J. Wood, pastor, New Life Christian Fellowship, Riverside, California. 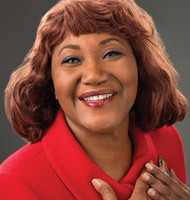 Dr. Hyveth Williams is professor of homiletics at the Seventh-day Adventist Theological Seminary at Andrews University in Berrien Springs, Michigan. She previously served for almost 14 years as senior pastor of Campus Hill Church in Loma Linda, California. She is the first black female pastor and the first female senior pastor in the Seventh-day Adven­tist denomination. She also served as an adjunct professor of religion on the Loma Linda University faculty of religion. She is the author of four books including Anticipation: Wait­ing on Tiptoes for the Lord and Secrets of a Happy Heart: A Fresh Look at the Sermon on the mount.